The focus was on health care and threats a candidate like Brett Kavanaugh would be. Ms. Diggs talked about herself and her clients with HIV/AIDS. Ms. Paliga opened with the need for Medicaid expansion and talked about changed process for confirmation (simple majority vs. needing 3/5 (60 votes) to confirm. Ms. Freeze talked about threats to health care, choice and Planned Parenthood. 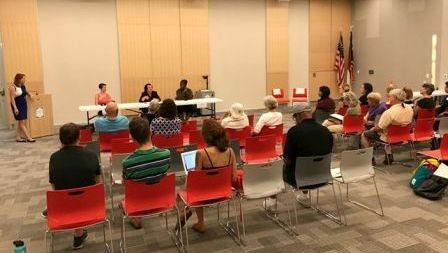 Over 40 people attended in Winston-Salem. 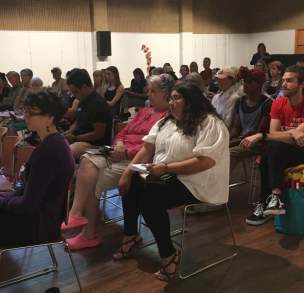 The #SaveRoe town hall in Raleigh was at Sertoma Art Center on 8/30/18. It was very well attended, estimates 55-60 people. 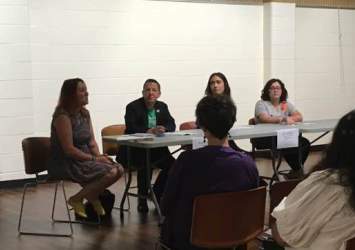 Panelists were Ames Simmon, Director of Policy for Equality NC; Dani Hoffpauir, field organizer at Planned Parenthood South Atlantic; Becki Fernandez, volunteer with Naral Pro-Choice NC. Panel at #SaveRoe town hall in Raleigh on 8/30/18. The Raleigh town hall was last of this series of town hall events to discuss Roe and/or SCOTUS (Supreme Court of the United States) and dangers that nominee Brett Kavanaugh poses to so many people. Thanks to Jen Ferris of Progress North Carolina, for coming up with the idea, organizing the events, and moderating the town halls around the state. Many organizations worked together to provide speakers and encourage their members to go. This entry was posted in abortion, ACA, Access to facilities, families, health care, Medicaid, medicaid expansion, Obamacare, pro-choice, racism, Roe v Wade, Rural women, Supreme Court, town hall and tagged ACA, medicaid, medicaid expansion, Roe v Wade, Supreme Court, town hall. Bookmark the permalink.